Some (of my) plays have gone through rehearsal and ended up on the stage without even so much as the punctuation having changed. Others have benefited substantially from the rehearsal process. Sometimes the actors have made me aware, in the course of the rehearsal process, of moments that needed fleshing out and points that hadn’t been made strongly enough. Obviously when it comes to the question of telling stories about other people’s lives in a situation as political as South Africa, you get to be political. So political commitment isn’t really something I’ve had to look for; it was an automatic by-product of my being a storyteller—one who is going to try to tell stories truthfully and through them bear witness to the South African situation. Talking with young students at Yale recently, I was asked whether I agreed with a fellow South African writer . . . who said that all writers in that country had an obligation to make a political stand. I got angry about this because I don’t think any writer should presume to give orders to another. The place from which you take your orders is probably the most secret place you have. If you have a word like God in your vocabulary, then that is an area in which you and God deal with each other. So, no writer must ever presume to tell another writer what his or her political responsibilities are. It is a poet’s right in South Africa to write a poem that seemingly has no political resonance. Some writers do nothing but talk about the objective moral obligations that artists must live up to. If you’re Brecht, you’re going to write as Brecht writes; you’re going to be as committed as Brecht. There may be pale imitations, but there will only be one Brecht. Every artist does as he needs to. There is a desperate tendency to try to legislate artists, to try to lay down rules for their obligations to society. Just leave artists alone. If you are a true artist, you will have a very finely tuned moral mechanism. If you’re a Georgia O’Keeffe, a Bertolt Brecht, or a Harold Pinter, you’ll do it your way. Exile is a phenomenon I have watched with morbid curiosity over the years because it is a fate that has befallen a lot of my friends. It is something I have watched but not experienced. I do not consider myself to be in exile. I could play around with words and say that I consider myself an exile from the society that I believe South Africa should be, but that’s just being clever. Art has a role. Art is at work in South Africa. But art works subterraneanly. It’s never the striking, superficial cause and effect people would like to see. Art goes underground into people’s dreams and surfaces months later in strange, unexpected actions. People bring a sort of instant-coffee expectation to art; they’d like the results to be immediate. It doesn’t work that way. I like that image of art dropping down through the various layers of the individual’s psyche, into dreams, stirring around there and then surfacing later in action. If you’d like to read what playwrights such as Arthur Miller, Sam Shepard, Joyce Carol Oates — and many more — have to say about the art and craft of writing for the stage, type “On Playwriting” into the small sidebar window and tap the “Search” button. 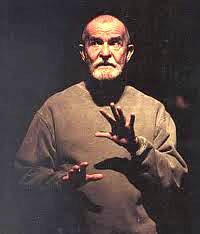 Part VI of the Athol Fugard series will post next Wednesday. This entry was posted on Wednesday, November 28th, 2012 at 7:25 am and is filed under acting, actors, drama, playwriting, quotes, relationships, theater, writing. You can follow any responses to this entry through the RSS 2.0 feed. You can leave a response, or trackback from your own site.